It was nostalgic to see Bang in SKT T1 colors. Bae “Bang” Jun-sik left South Korea for North America at the beginning of this season, but it feels like it was just yesterday that he was next to Lee “Faker” Sang-hyeok on SK Telecom T1, now known as T1. Fans were treated to a moment of nostalgia today, though, as Bang jokingly stood with SKT in their lineup for their game against Afreeca Freecs. It looked like a regular match as the camera panned over the SKT T1 lineup. 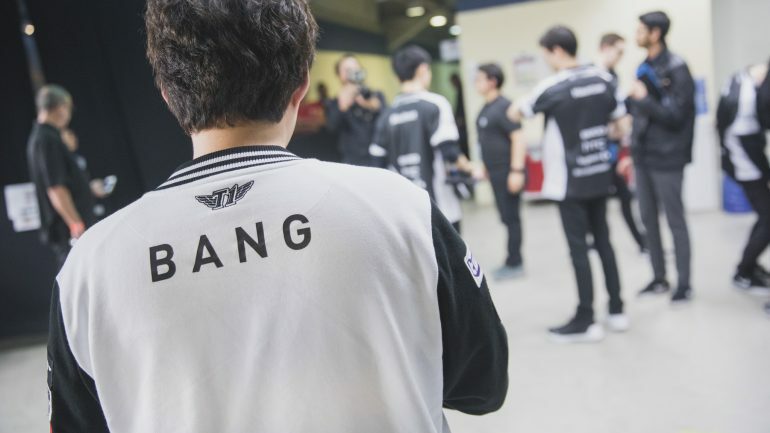 But fans quickly realized that Bang was behind Faker in the lineup, which caused them to cheer. The LCK commentators and the SKT players all began laughing as Cho “Mata” Se-hyeong swatted Bang away playfully. As the casters said, this was like Bang handing off the reins to the next generation of SKT AD carries. The two-time world champion took his leave in the last offseason to join the LCS with 100 Thieves for the 2019 Spring Split. Unfortunately, he hasn’t had the start he wanted in the region, ending up in last place for the regular split. SKT T1, on the other hand, have made a huge turnaround from their lackluster performance last year. After adding multiple star players in every position, SKT now look poised to reclaim their title as the best team in the world. Bang’s appearance begs the question—could SKT have been this good with him in the lineup instead of Park “Teddy” Jin-seong? The fiery young marksman has been a crucial part of SKT’s success, but could a fresh collection of talent have reinvigorated Bang for this season? We’ll never know the answer to that question, but it’s fun to think about the what-ifs.